Ivana Rubino works at Biogen, 225 Binney Street, Cambridge, Massachusetts 02142, United States. Bruce Albala works at Eisai, Inc., 100 Tice Boulevard, Woodcliff Lake, New Jersey 07677, United States. Samantha Budd Haeberlein works at Biogen, 225 Binney Street, Cambridge, Massachusetts 02142, United States. Johan Luthman works at Eisai, Inc., 100 Tice Boulevard, Woodcliff Lake, New Jersey 07677, United States. Alzheimer’s disease (AD) is a progressive and irreversible neurodegenerative disorder that accounts for an estimated 60% to 80% of all cases of dementia1. The accumulation of amyloid beta (Aβ) peptides into plaques, the formation of neurofibrillary tangles containing the tau protein, and degeneration of neurons have all been identified2 as key processes underlying AD. The pathological changes due to AD can precede cognitive symptoms by decades2. Approximately 50 million people around the world have dementia, and this number is expected to almost double every 20 years. The majority of this growth will affect low- and middle-income countries, where the number of older people is forecast to increase more than in higher-income countries3. The rate of onset of AD is expected to accelerate as the population ages and life expectancy increases1. Due to the number of people affected as well as the slow and insidious course of the disease, AD has a high financial and social burden of care1. The cost of dementia care is rising, with the total estimated worldwide economic burden expected to swell to US$2 trillion by 20303. Although treatments to ameliorate symptoms in the dementia stage of AD have been available for more than 20 years, there is currently no disease-modifying therapy that can impact the underlying pathology of AD to delay the onset or slow the progression of clinical symptoms4. Estimates have suggested that delaying the onset of AD dementia by just five years would reduce the economic burden by 36% by 20505. Despite numerous setbacks in the development of a disease- modifying therapy for AD, many experts agree that this remains an achievable milestone in the near future6,7,8. Biogen and Eisai, together with the Alzheimer’s community of academic and industry researchers, are committed to transforming this hope into reality. The amyloid hypothesis remains the dominant framework to describe AD in clinical research and continues to influence the development of potential treatments for AD9. According to the amyloid hypothesis, Aβ is the driving influence for AD pathology, leading to amyloid plaques, neurofibrillary tangles, synaptic dysfunction, neurodegeneration, and, subsequently, cognitive impairment and clinical dementia9. Evidence suggests that abnormal accumulation of Aβ may begin as many as 20 years before the onset of clinical dementia2. Although abundant evidence, including human familial genetics, supports this mechanism of disease, continued investigation is needed to validate and refine this hypothesis9. An imbalance between overproduction and inadequate clearance can cause Aβ peptides to aggregate and accumulate in the brain in the form of amyloid plaques9. 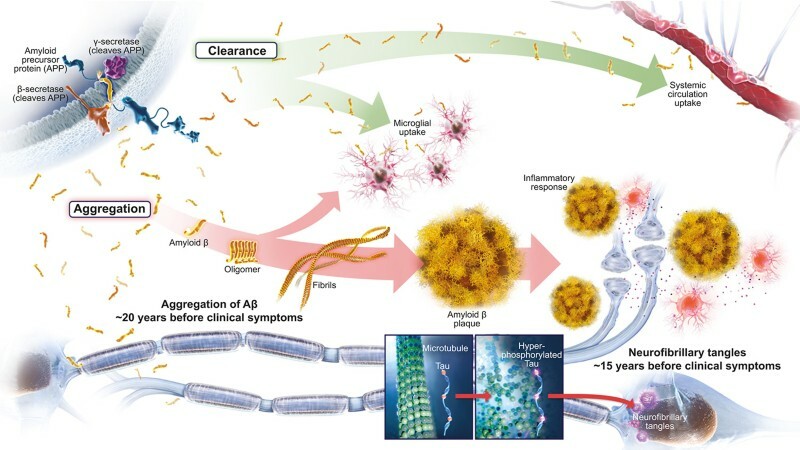 Thus, amyloid-targeting therapeutic approaches for treating AD largely aim to reduce Aβ by targeting production and aggregation or by facilitating clearance (Figure 1)9. Over the past few decades, multiple Aβ-targeting therapies have been tested in clinical trials. Although none of the trials met their primary endpoints, they have greatly increased our understanding of AD and the role of Aβ9. Sound explanations suggest why earlier trials may have missed their endpoints, and these lessons, coupled with knowledge gained from ongoing cohort studies, continue to influence the rational design of new compounds and trials. Improvements in trial design – such as enrollment of patients in the earliest detectable stages of clinical AD, selection of patients with confirmed Aβ pathology, rigorous evaluation of target engagement, and the use of endpoints designed to measure meaningful change – will allow more rigorous testing of the amyloid hypothesis in ongoing trials of amyloid-targeting agents8. The results of post hoc and pooled analyses from clinical trials that have missed their primary endpoints suggest that anti-amyloid therapy may have beneficial effects in patients who are earlier on the AD continuum and are treated with higher doses10,11. Together with recent promising trial results, these data provide a rationale for the continued exploration of the amyloid hypothesis in clinical trial settings12. There is a misperception that only very old people are affected by AD. In reality, clinical symptoms of AD can begin as subtle changes years before a diagnosis of dementia and may even be dismissed as symptoms of normal aging1,13. However, AD exists as a continuum that extends from the asymptomatic individual with biomarker evidence of AD to the patient with severe dementia due to AD (Figure 2)2. A considerable amount of research is aimed at identifying and validating biomarkers of AD that can detect the presence of pathology before or at the beginning of when clinical symptoms become present2,8. Because mild cognitive impairment can be due to a number of underlying biological and medical conditions besides AD (such as cerebrovascular disease or Lewy body dementia), a timely and accurate etiologic diagnosis is imperative for appropriate disease-specific patient management, which may include considering participating in clinical trials1,2. 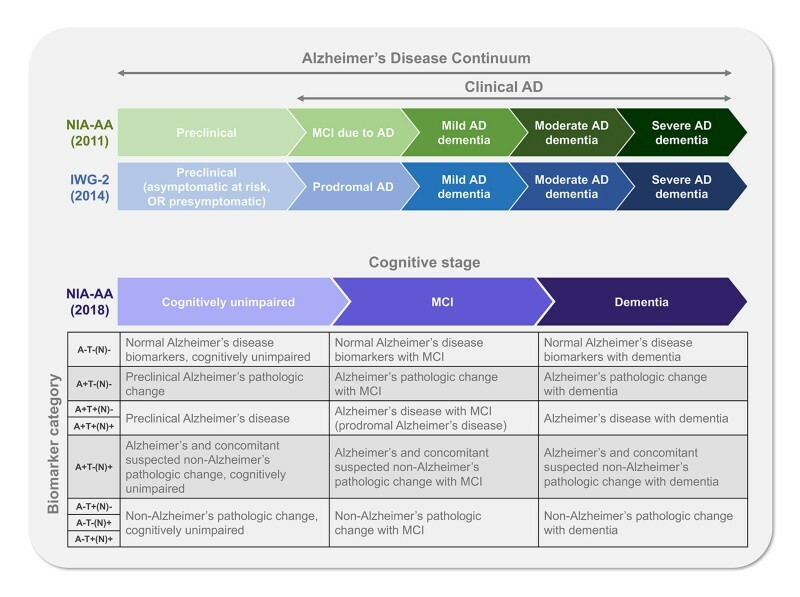 Evolving diagnostic frameworks such as the National Institute on Aging and the Alzheimer's Association (NIA–AA) and International Working Group (IWG) diagnostic criteria incorporate the use of biomarkers in combination with clinical criteria to accurately diagnose mild cognitive impairment due to AD14. Moreover, in the new NIA–AA diagnostic framework for research use, stages of AD are defined using biomarkers of underlying pathology to supplement clinical staging, moving the definition of AD further toward that of a disease defined by underlying pathological processes and allowing a specific diagnosis as early as the presymptomatic phase of the disease2. In the new research framework, in addition to the evaluation of cognitive symptoms, biomarker profiles are used as informative labels to summarize the extent of amyloid pathology (A+/−), pathological tau (T+/−), and neurodegeneration (N+/−) in each patient2. Thus, this research framework is aimed at characterizing the disease in a detailed and discrete manner to reduce heterogeneity, thereby allowing for the advancement of knowledge to be gained from both clinical trials and registries2. Currently, although biomarker testing is available in the research setting, it is not readily available in clinical practice1. Challenges such as potential constraints on reimbursement and infrastructure remain when considering the expansion of biomarker use to routine clinical testing1,6 In the meantime, trials offer the opportunity to further validate candidate biomarkers that may be useful for routine clinical diagnoses. Because the disease pathology starts long before the appearance of symptoms, early intervention with a disease-modifying therapy is considered the most promising approach to impact the underlying pathophysiology and delay the onset of symptoms and progression of AD14. However, even in the absence of a disease-modifying therapy, there are benefits of a timely and accurate diagnosis1. There is general agreement that early and accurate diagnosis of AD with biomarker confirmation could translate to healthcare savings. Multiple studies support the economic benefits of early diagnosis, including one from the Alzheimer’s Association reporting a potential saving of US$7.9 trillion for the current United States population from identification of AD at the mild cognitive impairment stage, rather than the dementia stage1. Early intervention allows patients to make lifestyle adjustments that can aid in preserving cognitive function. In addition, patients can be closely monitored with regular health screenings and may have the opportunity to enroll in clinical trials of investigational interventions. Moreover, patients who are diagnosed in the early stages of AD can maximize time with their family and loved ones while initiating planning for future care and finances1. Fig. 2: Frameworks defining the stages of Alzheimer’s disease2,14 A, amyloid beta deposition; AD, Alzheimer’s disease; IWG–2, International Working Group 2; MCI,mild cognitive impairment; N, neurodegeneration; NIA–AA, National Institute on Aging and the Alzheimer's Association; T, pathological tau. Despite the importance of an early and accurate diagnosis, barriers exist in the current healthcare system that make the journey towards a diagnosis difficult for patients and their loved ones13,15. Early cognitive symptoms may go undetected and there may be a lack of proactive assessment in a general practitioner setting, leading to multiple referrals without a clear diagnosis13. Potential barriers that contribute to these inefficiencies include concerns about misdiagnosis, limited specialist availability, uncertainty about disclosing diagnosis and low reimbursement rates13. Challenges for patients may include anxiety, denial or neglect to seek a diagnosis stemming from the lack of available treatments15. In addition to current challenges, the number of patients likely to be introduced into the healthcare system once a disease-modifying therapy becomes available will put considerable strain on the current healthcare infrastructure6. Infrastructural barriers include training a sufficient number of Alzheimer specialists, feasibility of biomarker testing for routine clinical use and screening the ‘at-risk’ population (based on their age, family history and subjective memory complaints) for treatment eligibility1,6. Future healthcare models will require collaborative and transdisciplinary care teams to partner effectively with patients and caregivers to provide optimal patient management. Although the approval of a disease-modifying therapy would increase the incentive for healthcare settings to evolve, there are current opportunities to improve and streamline this process, including increasing education about the benefit of early detection and diagnosis and establishing clear guidelines for healthcare providers7. As of 2017, there were roughly 105 agents in the AD treatment pipeline, 70% of which were being tested as potential disease-modifying therapies for AD and 18 of which were in phase 3 of development4. The number of participants needed for the completion of ongoing AD trials exceeds 50,0004. The ability to recruit enough individuals for AD clinical trials is a substantial challenge in drug development4. Because clinical trial research evaluates therapies aimed at preventing or slowing AD and assesses the benefits and risks of these potential treatments, improved clinical trial design, including the incorporation of more appropriate endpoints to reduce sample sizes and study duration, is imperative8. In addition to the potential discovery of a new treatment, the benefits to a patient of participating in clinical trials include gaining access to disease education, the potential to receive high-quality care, close monitoring of health, and disease management1. We are driven by the profound unmet needs of patients, families, caregivers and society, and we are undaunted by historically high failure rates in the AD field. As part of our commitment to continue research and help those impacted by AD, Biogen and Eisai have established a partnership to research investigational therapies targeting multiple known causes of AD at the earliest stages of disease. As part of this research collaboration, we have progressed two therapies into actively recruiting phase 3 clinical trials to test aducanumab (NCT02477800/NCT02484547) and elenbecestat (NCT02956486/NCT03036280) in addition to the ongoing phase 2 clinical trial (NCT01767311) with BAN2401. Both Biogen (www. biogen.com) and Eisai (www.eisai. com) have strong and diverse portfolios with multiple agents at different stages of development. Despite the years of research that have provided valuable insights into the pathology of AD, challenges remain in (1) developing and testing therapies that modify the disease course of AD and (2) guiding patients effectively through an optimized diagnostic and healthcare journey. Collaboration within the AD community, including public and private partnerships, academia, industry and regulators, is extraordinary and continues to move the field forward. Together as a scientific community, we are committed to working together to optimize patient management, fully understand the science underlying AD, and develop effective treatments that meaningfully impact the course of disease. Medical writing support and editing for this article was funded by Biogen and was provided by Nucleus Global. Ivana Rubino, Samantha Budd Haeberlein and Philipp von Rosenstiel are employees and shareholders of Biogen; Chad J. Swanson, Bruce Albala and Johan Luthman are employees of Eisai, Inc.
Alzheimer’s Association. Alzheimers Dement. 14, 367–429 (2018). Jack, C. R. Jr et al. Alzheimers Dement. 14, 535–562 (2018). Prince, M. et al. World Alzheimer Report 2015: The Global Impact of Dementia (Alzheimer’s Disease International, 2015). Cummings, J. & Fox, N. J. Prev. Alzheimers Dis. 4, 109–115 (2017). Lewis, F., Karlsberg Schaffer, S., Sussex, J., O’Neill, P. & Cockcroft, L. The Trajectory of Dementia in the UK — Making a Difference (Office of Health Economics, 2014). Liu, J., Hlávka, J., Hillestad, R. & Mattke, S. Assessing the Preparedness of the U.S. Health Care System Infrastructure for an Alzheimer’s Treatment (RAND Corporation, 2017). Ritchie, C. W. et al. Alzheimers Res. Ther. 9, 85 (2017). Cummings, J. et al. Alzheimers Res. Ther. 8, 39 (2016). Selkoe, D. J. & Hardy, J. EMBO Mol. Med. 8, 595–608 (2016). Mackey, H. et al. Alzheimers Dement. 12, P610 (2016). Ostrowitzki, S. et al. Alzheimers Res. Ther. 9, 95 (2017). Sevigny, J. et al. Nature. 537, 50–56 (2016). The Gerontological Society of America. Cognitive Impairment Detection and Earlier Diagnosis (The Gerontological Society of America, 2015). Dubois, B. et al. Lancet Neurol. 13, 614–629 (2014). Dubois, B., Padovani, A., Scheltens, P., Rossi, A. & Dell’Agnello, G. J. Alzheimers Dis. 49, 617–631 (2016).